Vagnari (Italie): Were Roman slaves hungry? What was it like to be a slave in the Roman Empire? The answer, according to the latest excavations at Vagnari, is that slaves were rather better looked after than one might expect: they ate quite well, they suffered less from childhood starvation than did the population in general, and when they died, the grave goods they were buried with suggested that they were certainly not living in abject poverty. This at least was the implication of research that was revealed in a recent conference held at Edinburgh University organised by Alastair Small on 26th – 28th October 2012, when Alistair Small and his associates told us about their latest work at Vagnari. Vagnari is the name of an abandoned farmstead – you will not find it on any map, but it lies just outside the town of Gravina, near Bari in Apulia. 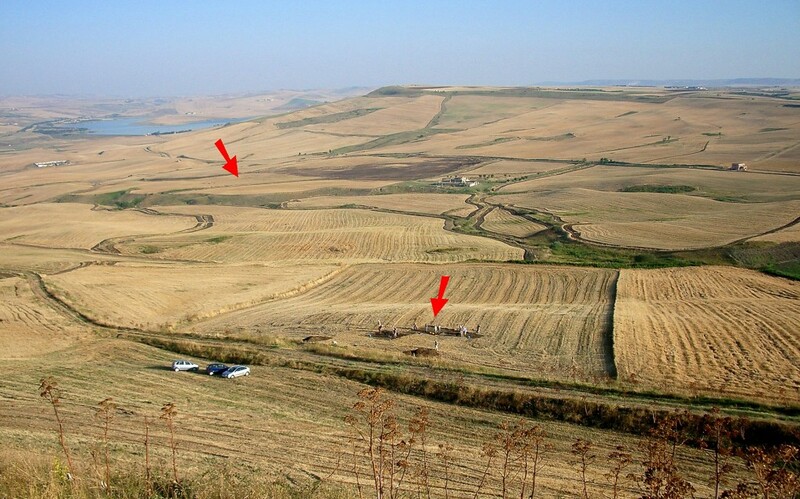 Here Professor Small has been excavating for nearly 40 years, at first in the nearby hillfort of Botromagno, and subsequently doing field surveys over the whole area which revealed an interesting site at Vagnari: we have already covered the whole history in Current Archaeology 45. 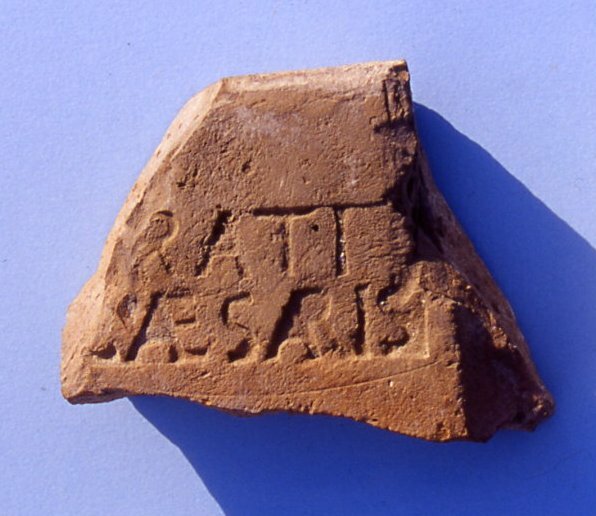 But in the Roman imperial period, it appears to have been an imperial estate, centred round a tile works, and one of the tiles was found stamped with the name of Grati Caesaris, which means the work of Gratus, slave of Caesar. And the argument goes that if the person who stamped his name on the tiles was a slave of Caesar, then presumably this was an imperial estate and all the other workers would have been, if not slaves as least as the very lowest end of society. Nearly 100 skeletons have now been excavated from a cemetery at the site, and the results of the extensive work on those skeletons carried out by Tracey Prowse of McMaster University in Canada are extremely illuminating. Excavating one of the skeletons: note the pot by the feet, and the second pot by the head, with a bronze roundel being excavated by the neck. Is the the burial of a slave? She has now examined nearly 100 skeletons, and 656 teeth which are particularly interesting as they give evidence for childhood stress. If you go through phases of malnutrition in childhood there will be bands in your teeth to reveal this stress. On this analysis Vagnari showed up remarkably well. Indeed comparing the Vagnari evidence with other known collections of teeth from Italy, Vagnari was among the best. And if Vagnari was a cemetery of slaves, then slaves were better fed than the normal population. An analysis of the grave goods by Liana Brent suggested that they were relatively well provided for in the next world, with an average of 7.4 grave goods for the males and 4.4 for the females. Indeed two of the skeletons were buried with spears and the spear tips were rounded showing that they had been used, presumably for hunting. It is difficult to see slaves possessing spears and using them and being buried with them, so perhaps these were tenants, coloni. Is this the reality of slavery in the Roman world? But were they slaves? And was this an imperial estate? Indeed what do we mean by an imperial estate? In loose terminology, an imperial estate is often thought to be state property, but in the Roman world there was a sharp distinction: in the early Republican period, the imperial estates were called the patrimonium, but by the third and fourth centuries it was called the res privata, to distinguish it from the res publica, that is the property owned by the Senate and People of Rome (SPQR). The res private was often very extensive, for when rivals to the Emperor were condemned, their was confiscated by the Emperor and became res privata: indeed Domenico Vera, Professor at Parma University, pointed out that in A.D. 422, 18.5% of taxable land in Africa proconsularis was res private. He introduced the concept of an Emphyteutic lease, which again I must confess I had not heard of, but which apparently existed in Roman law and is still found today in Quebec and most of Latin America. It is a long-term lease for a period of up to 99 years where the lessee agrees to add improvements to the property over the period of the lease so as to increase the value at the end of the lease period. But in return there is a reduced rent, or sometimes even a peppercorn rent. Apparently the Italian government has proposed that some of their historic buildings might be leased out to the public or companies on an Emphyteutic lease. Indeed the National Trust makes similar sorts of agreements. But were such Emphyteutic leases used in imperial estates where the land would be leased at a moderate rent which would guarantee the emperor a steady and constant income stream, but at the same time give the lessee every incentive to manage the property well? Another fascinating talk was by Philip Kenrick who is becoming the great pottery guru for the whole of the Mediterranean. There is one great oddity in the Vagnari pottery – a small but significant proportion of it comes from Illyria, that is modern Albania and Yugoslavia. This is an off-shoot of the very extensive excavations under Richard Hodges at Butrint in Albania, which is producing a massive database of material of all periods. And some of the pottery specialists trained at Butrint have been coming to Italy and have been looking at the pottery and saying “Hi, that is Butrint pottery”. We are used to the idea that in southern Italy many of the finewares in the early period, the terra sigillata, come from north Italy, to be replaced in the late period by African red slip wares. But Illyria is actually nearer than north Italy or Africa, so there is no reason why Illyrian potters could not be selling their wares in southern Italy. He suggested that we should look for a new terminology of redslip wares. Here in Britain we normally call them Samian pottery, which form the dominant finewares of the first and second centuries. In Italy and the Mediterranean such wares tend to be called terra sigillata, or Arretine wares, being produced not in Gaul but in northern Italy, but with the same technique of red pottery with a red slip on the surface, and elaborate moulded decoration. And just as in Britain Samian dies out at the end of the second century, so in the Mediterranian, the north Italian potteries around Arezzo die out and are replaced by African red slip wares. He suggested that we should use the term common slipped waresor regional slipped wares to cover all this pottery that was so ubiquitous throughout the Roman empire.